You will earn 549.42 Reward Points. Earn 1 reward point for every 1 dollar spent. Rise to the occasion! 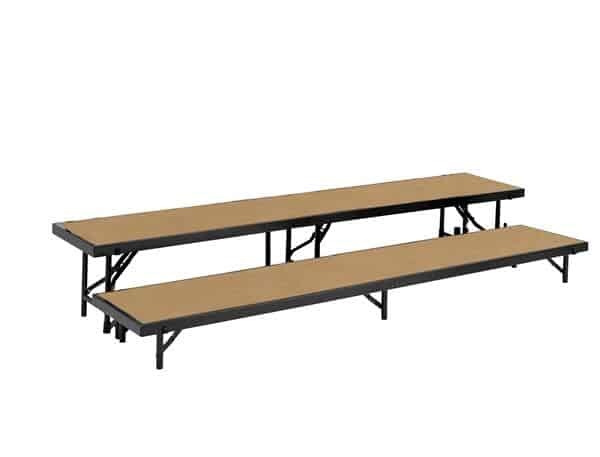 The NPS Straight Hardboard Multi-Level Standing Riser is the reliable and affordable choice for your school performances and assemblies. Users are supported by a heavy-duty, 16-gauge steel, black powder-coated frame. The premium 3/4" thick plywood deck is durable and features a firmly-affixed hardboard surface. Legs are constructed with 14-gauge steel tubing and feature simple and safe spring-loaded locking mechanisms allowing for quick set-up assembly and folds up easily for manageable portable storage. The stage offers secure a weight capacity of over 200 lbs. per square foot. High-impact plastic glides will ensure floors are protected from damage. Firmly welded ganging devices let users combine equal-height stages to create a large single stage platform or assemble different sizes to create standing riser configurations. Ships fully assembled.